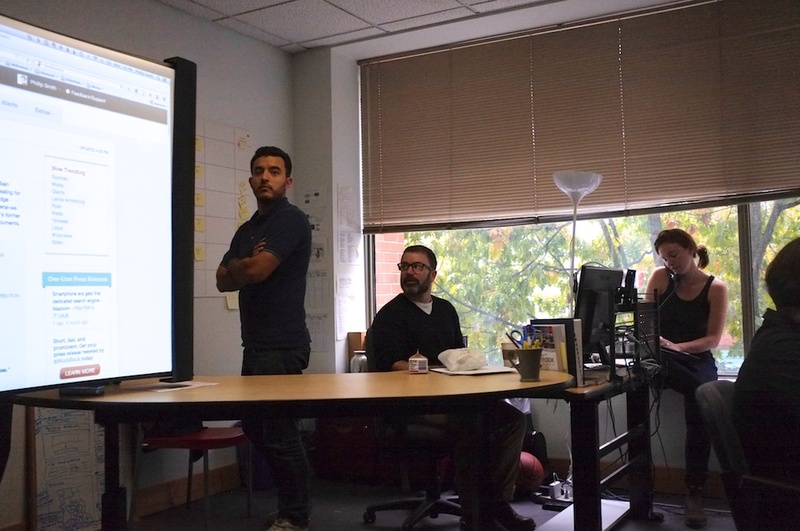 Last Wednesday, as part of an ad-hoc series of lunch-and-learns I’m delivering in The Tyee’s newsroom, several reporters gathered to learn about a handful of new technical tools that can be used to supplement traditional reporting. I’ve spent enough time with the Tyeesters over the years to know that they’re not easily impressed, and – for a room full of people under forty – have a surprisingly traditional take on what makes “good journalism.” So, early on, I decided to focus on tools and technologies that could help out with reporting in some tangible way: this session focused on Muck Rack and using Google Forms and Fusion Tables together to generate automatically updated visualizations (I’ll tackle the Google stuff in a separate post). Muck Rack Pro is an online tool for “journalists and communications specialists” that is available at no-cost for verified reporters. What’s interesting about Muck Rack is that the site has curated an enormous list of professional reporters (as determined by their work and who they work for) that are on Twitter. It then takes this network of reporters and determines what they are talking about at any given moment, i.e., what top stories of the day are the most interesting to those who are spending their days thinking about that very question. Beyond the Newsroom feature (top stories), there are a number of other ways that Muck Rack can be used. For starters, journalists can create a profile on Muck Rack to promote their work (for example, here’s Tyee education reporter Katie Hyslop’s new profile). Each day, Muck Rack profiles one of the journalists in their network in their daily newsletter (honestly, one of the few daily e-mails I subscribe to). The pro version also enables reporters to perform advanced searches across the Muck Rack dataset, which makes it possible to narrow down the information stream by publication, beat, or a variety of other facets. Journalists can also set-up keyword alerts, sent by e-mail, and “media lists,” which are hand-curated lists of other reporters. In a nutshell, Muck Rack is a power tool for reporters that have an interest in knowing what other reporters are saying. If you don’t fall into that category, there are probably still some benefits that would be worth the few minutes it takes to set up a Muck Rack account. Organizations can submit a spreadsheet of reporters and their twitter handles to get listed on Muck Rack with a publication page. As mentioned, I’ve been getting the Muck Rack daily e-mail newsletter for several months now. It’s one of the few daily newsletters that I subscribe to (other than The Tyee’s daily newsletter, obviously!). It’s a quick read and the quality of the information is excellent; it’s reminiscent of the now-defunct Maisonneuve magazine’s daily Media Scout. Right now, I must admit, that the focus on the US election isn’t well-tuned to my interests, but typically the newsletter touches on several stories that I might otherwise miss, and keeps me up-to-date on the machinations of the news publishing business. Last but not least, the Muck Rack alerts mentioned earlier, which I’ve been receiving for a week now, are also proving to be quite useful. Short, concise, e-mails – sent when you want – that cover not only when reporters tweet your keywords, but also contains matches for items that they’ve tweeted about that pertain to your search. I suspect that one could really spend some time with the alerts tool and narrow those searches down into something very high-signal, low noise. If you like knowing about useful tools for reporting like these, you may want to come to tonight’s Freelance Survival Series event at The Hive in Vancouver. It’s almost sold out, so act fast.